This magnificently flamboyant house was built in the 1950s, with no regard to expense, for a local industrialist who clearly intended its grand reception rooms to impress visitors and to permit lavish entertaining. It is situated within a few kilometres of the fabulous beaches and dunes of the Cote d'Opale and less than an hour's drive from the channel tunnel or Calais ferries. Nearby rail and motorway links give access to the centre of Paris in less than 2hr30m by car or train, and the centres of Brussels and London are less than 3hrs by car. Its position at the edge of a pleasant village (where locals know it as "the Palace") makes for convenient access to local shops while major hypermarkets are only 6 kilometres distant. The towns of Berck and Montreuil sur Mer are nearby. The nearby lakes, river estuary and bay provide convenient facilities for birdwatching, fishing, sailing and wildfowling and the coastal countryside criss-crossed by lanes and tracks is ideal for cycling. The layout of the house is remarkably flexible. 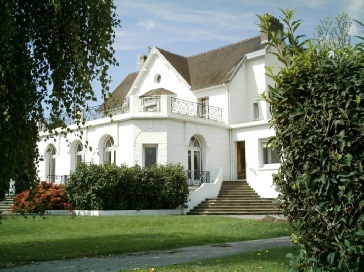 Although it is currently arranged in such a way as to provide spacious family living quarters, with a Granny Flat or comfortable guest or staff apartment, it can easily be adapted for use as a B&B or even divided into gite apartments with the minimum of structural alterations, which could be reversed as required at any time. The current owners derive an average annual income of around 9,000 euros from the guest apartment which is occasionally let to holidaying couples.